Each Halloween we try and think of a costume that is spooky in an everyday sort of way. In years past that has included everything from cockroaches to those Crocs shoes. 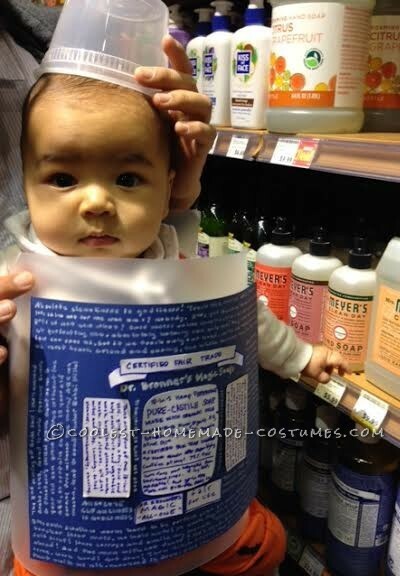 We have always used Dr. Bronner’s soap at home, and have always laughed about how weird the bottle is, so we knew that it had to be the inspiration for this year’s costume. We knew how we wanted to construct the bottle, but our main obstacle was figuring out how to put it on the baby. It was simple to make with a thick plastic sheet that we bought from a local art store, construction paper, paint pens and magic markers. In the future we’ll use a white out pen instead of a paint pen, since it bled through the paper a little. The hardest part was getting the baby to be excited about it, and the best part was taking him to the local health food store for the photo op.